You are in unfamiliar territory, your maps don’t seem to be much help, and there’s no one in sight to point you toward a landmark. Knowing that going in the right direction will save the day, you wish you had a compass. Here’s a group of watches that will point you in the correct direction and they are all so cheap that there’s no excuse not to buy one to leave in the car, strap to your bike, hang on your backpack, or wear on your wrist when you go on a trip into the great unknown. This is one blogger that constantly needs directional help and believes the compass feature is nearly as important as any other on a watch. On sale for only $27. including shipping, this watch is the ultimate bargain. Get one and leave it in the glove compartment of your car for those occasions when you need to get back on course and knowing which way is north will make the difference. For only a few dollars more ($36) you can get the upgraded version, the CV-2″ with a reversed-out display housed in a black stainless-steel case. The compass is outfitted with several navigational features, including 16 directional indicators, 1-degree bearing increments, a bearing lock, a reverse bearing, easy calibration, an adjustable declination, and electromagnetic distortion warnings. The Northstar CW2 is no slouch as a timekeeper, either, with dual-zone time modes, a date and day-of-the-week display, and a stopwatch. 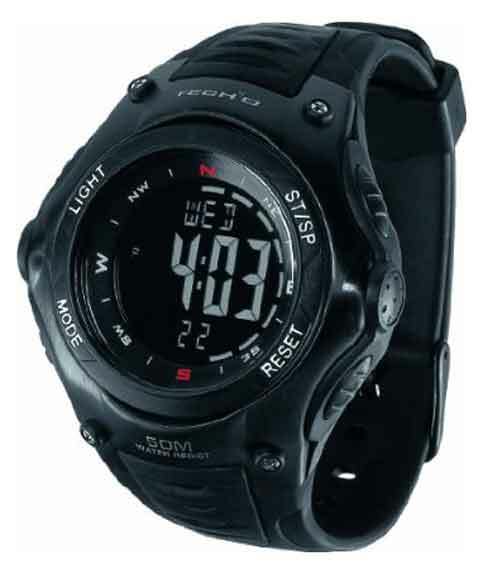 Other details include backlighting with a three-second display, a low battery indicator, and water-resistance to 150 feet. The Northstar CW2 carries a one-year warranty. For $41. this watch adds some bulk (46mm wide) and a few extra features to the compass-centric theme. It is not a G-Shock or a Protrek/Pathfinder, but it certainly benefits from the feature set and shock / water resistance technologies developed for it’s more expensive counterparts. This watch is outfitted with a temperature display – there’s also world time (29 time zones/48 cities), declination correction, a convenient stopwatch, four daily alarms and one snooze alarm, auto calendar, mineral glass for extra protection against scratching and a buckled resin band. Two of many Timex (compass equiped) timepieces are breifly discussed here. The price is right, the features are vast, and the look is rugged and manly. 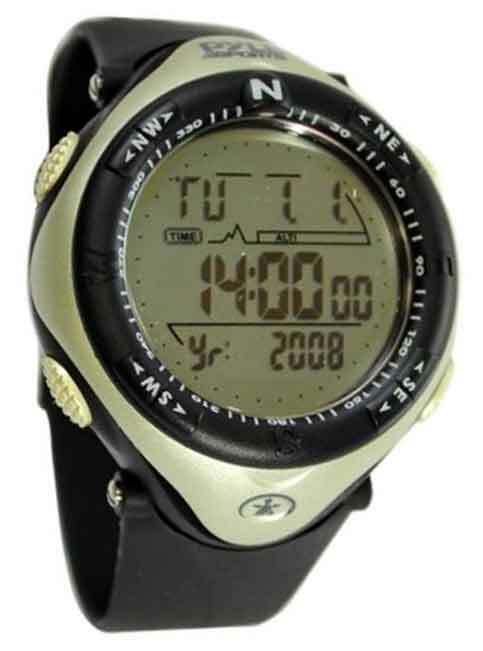 Those who would opt for a Timex would do well to refer to the Timex site for a more in-depth comparison of all the features and cosmetic options. The 40mm case is made of resin, and the digital face is prominently embellished with contrasting digital numerals. The bezel is adorned with directional coordinates to accompany the compass feature. 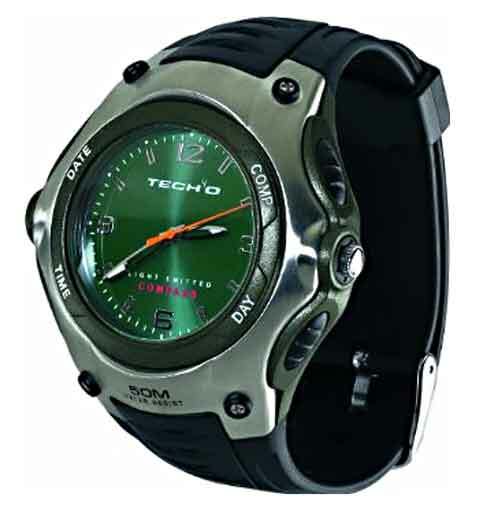 The watch comes equipped with a rugged leather band and a durable buckle clasp. Additional components include the three-alarm feature and the Indiglo night light. Exercise devotees will appreciate the chronograph split and lap options, as well as the hydration alarm. This watch usually sells for around $35 to $40. It includes a compass, 100 hr. chronograph, adjustable bpm beeping pacer, and countdown timer. At $26. including shipping, this is an excellent bargain. Available in blue or black. 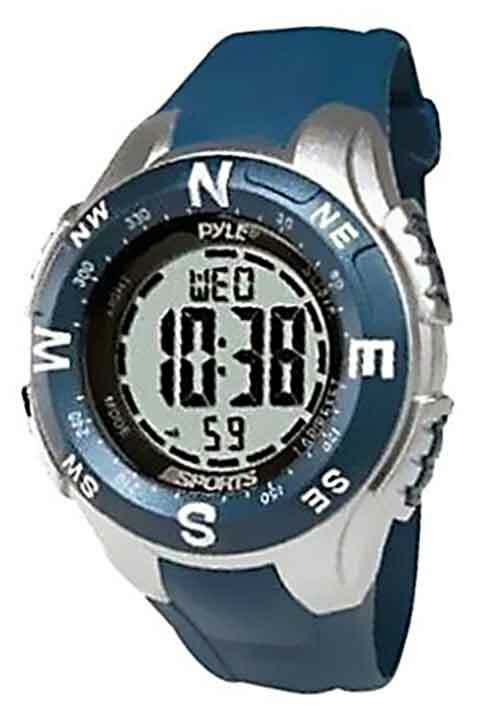 This upscale Pyle Sportts watch is only $42 and has an impressive feature set. It’s equipped with an altimeter, compass, stop watch with 30 lap memories and average lap calculation, barometer, and perpetual calendar. Get the current altitude to a resolution of 0.5m or 1 ft and the current/average speed of ascent. Always know which way you’re heading with the electronic compass equipped with magnetic distortion alert. Time events with the precision stop watch, providing resolution down to one-hundredth of a second up to 10 hours long. Measure pressure and forecast the weather with the built-in barometer. And always stay on top of the time and date with the clock, perpetual calendar and 12/24 hour display. With its digital compass, night vision, and more, the Freestyle Midsize Navigator Polyurethane Strap Watch will be your trusty guide wherever you go. Designed for men and women, this striking silver and black timepiece holds up to your active lifestyle with its durable plastic case, stainless steel bezel, and polyurethane strap with Free Fit Technology for a comfortable fit. Framed by a silver-tone compass bezel, the round black dial has a digital display and extensive functions, including a NightVision backlight, a date calendar, two alarms, a countdown heat timer, dual time, and a 30-lap memory chronograph. Featuring quartz movement, this Freestyle unisex watch is water resistant to 330 feet. It sells for around $50. 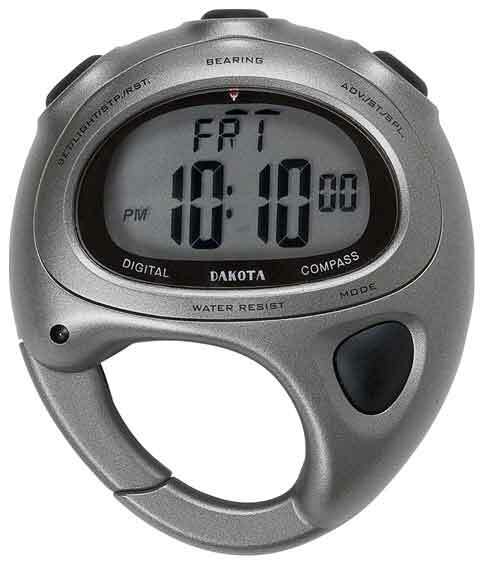 This last entry is not a wrist worn watch, but more of a small clip-on multifunction clock. It is only $25. The display is especially large and with the carabiner style loop it can be quickly attached to a belt loop, backpack for easy access. 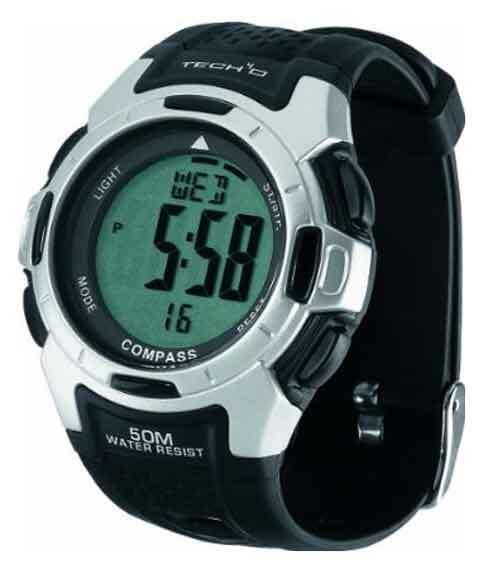 it tells you the time in 12- or 24-hour format and also serves as electronic compass, timer, chronograph, and alarm. Digital quartz movement. Moonglow E.L. dial light. Splash resistant. Case is 3″ L x 2″ W. It is available in grey or blue.